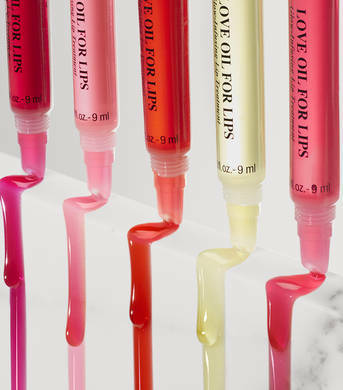 Reportedly inspired by the 1960s Summer of Love, Kiehl’s new Love Oil For Lips takes the brand’s already-solid devotion to lush lips to a whole new level. Lightweight lip oils designed to boost moisture for softer, smoother smackers, this beautiful formula hydrates and nourishes lips whilst leaving them with a luscious shine and smooth, natural-looking glow. Formulated with a luxurious blend of Coconut Oil, Moringa Oil and Acerola Cherry Extract, they bridge the gap between colour and care by lending a hint of super flattering colour along with some serious moisture boosting action. They were designed to be worn alone or to be layered on top of your favourite lip formula, and the ones I’ve been playing with have proven to be a godsend on days at the beach and the events that have rolled out after. By day I’ve layered them on top of the brand’s Butterstick Lip Treatment SPF 30 for sun protection with a twist, then at night over my favourite mattes for a summery finish. On counter on February 18 and available in Untinted or with a hint of colour in Botanical Blush, Neon Pink, Apothecary Cherry and Midnight Orchid, you apply them by squeezing a drop onto your fingertip or smoothing directly onto the lips. Apply liberally throughout the day and watch them work their magic!